There is something about the streets of New York, it is really unlike any other city in the world. I wanted to share my favourite outfit from my trip on my blog today and I honestly love how these photo's have turned out. 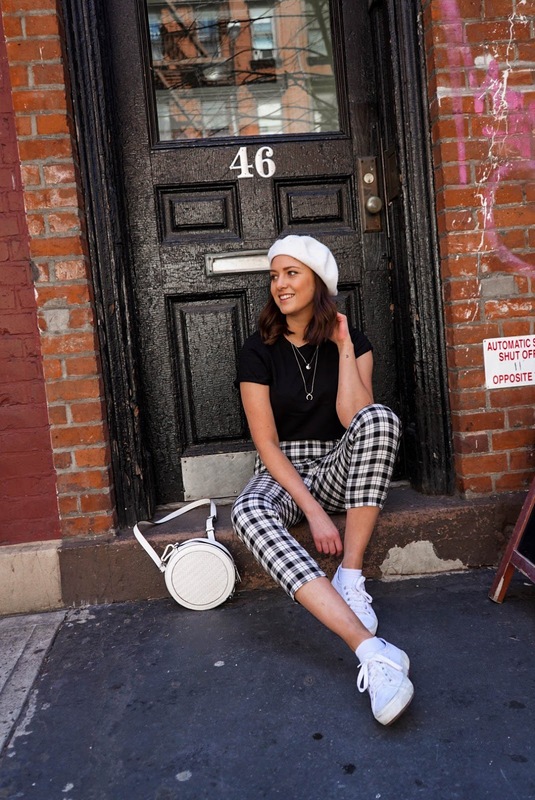 My friend snapped these as we were waiting outside for a table at Jack's Wife Frida - which I would definitely recommend going to for brunch or lunch if you are in New York. Not only is it very instagrammable, but the staff were so friendly and lovely and we all had the most amazing food. 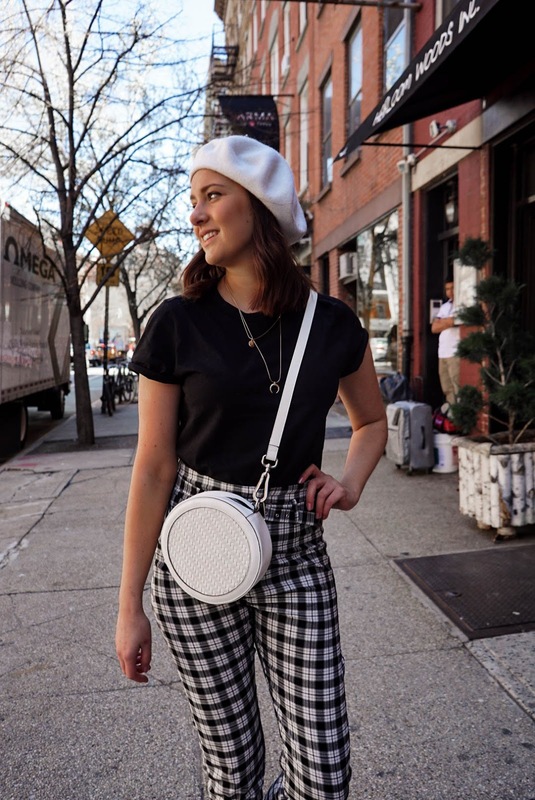 We went to the one on Lafayette street and there are a lot of other cool places nearby like Milk, Glossier, and is also near all the shops in Soho too, so a perfect area to go for a wander round afterwards really. I am obsessed with these high waisted check trousers. They are so easy to wear, so flattering (they make me look way slimmer than I am - winner!). 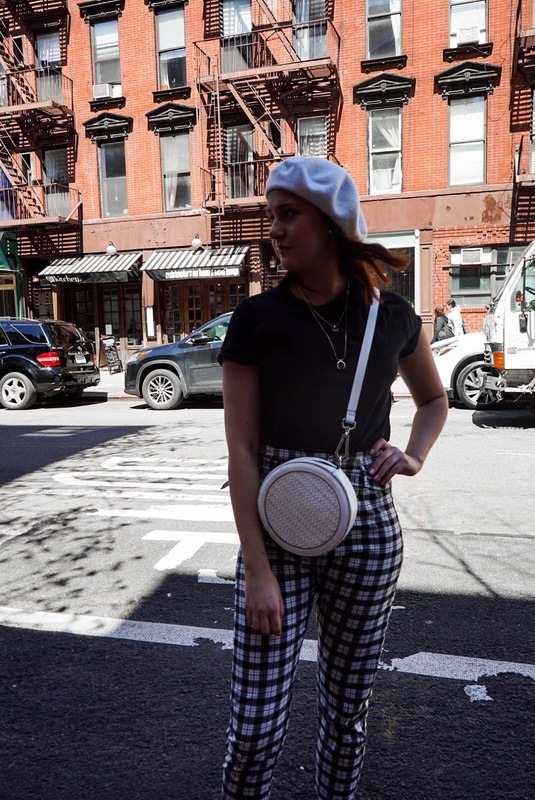 Since the trousers are the statement piece here, I kept the rest of the look super simple with a black tee, my trusty Superga trainers that I love and then accessorised the look with a white beret and an on trend little circle bag. I have been editing my photo's recently with Lightroom and I am obsessed. You can really do so much more with an image than on Photoshop, so I have been having a lot of fun playing around with different editing styles. I love how these edits have turned out. Would love to know your thoughts? I hope you liked this outfit and I wish you all a lovely sunny bank holiday weekend! I am in love with those trousers! I have been looking for some like this for ages! I'm absolutely loving these shots and oh my it's making me miss new York! Oh wow these pictures are insane! I love the outfit, the locations and everything! Truly lovely shoot!